In roughly 48 hours, the single cell of the fertilized frog egg will undergo dramatic change to develop vital body parts like muscles, a skeleton, eyes, a heart, and a tadpole tail. Scientists have been studying this process to better understand human development, birth defects, and cancer and to advance technologies like organoid generation and cell replacement therapy. Scientists can disrupt embryo development, pause it, and accelerate it; however, they can’t exactly explain how development works. Supported by the National Institutes of Health (NIH), bioengineers at the University of Pittsburgh are taking a crack at understanding what is going on inside the egg. The NIH Department of Health and Human Services awarded McGowan Institute for Regenerative Medicine affiliated faculty member Lance Davidson, PhD, professor of bioengineering at Pitt’s Swanson School of Engineering, $1,327,207 for his study “Biomechanics of Morphogenesis.” Dr. Davidson, who directs the MechMorpho Lab at the University of Pittsburgh, aims to take a structural engineer’s approach to the biomechanics of developing embryos. The Pitt researchers are reverse-engineering the mechanical processes that shape the basic body plan and organ development in embryos using tests, techniques, and tools more likely to be found in a mechanical engineering lab than a molecular genetics lab. Dr. Davidson explains his study here. In the surrounding labs, researchers work with mice, fruit flies, zebrafish, and rats. In Dr. Davidson’s lab, there is Xenopus—a frog native to sub-Saharan Africa. Frogs are ideally suited for Dr. Davidson’s research because their embryos and tissues are incredibly tolerant of lab conditions and resilient to an engineer’s ‘touch.’ Even after removing them from their protective shells, inducing genetic defects, or injecting fluorescent protein tracers, these frogs won’t croak. The frog eggs start out about the size of a pencil tip. In a field of study that’s used to accommodating steel beams or reinforced concrete measurements, Dr. Davidson’s group has to get creative with the tools they use. By studying the mechanics of morphogenesis—the process of an embryo changing shape—Dr. Davidson hopes to develop a tool that will provide bioengineers with a much greater understanding of and control over tissue self-assembly. “Many engineering fields have some kind of software or simulation tool that can take the guess work out their designs before they actually start building. We are developing something similar for tissue engineers so they don’t have to rely on trial and error all the time,” explains Dr. Davidson. Creep tests, strain maps, and micro-aspiration are all engineering techniques employed by Dr. Davidson’s team to understand the underlying mechanics of morphogenesis. These frogs might not be turning into princes any time soon, but from a tiny ball of cells, the embryo can shape itself into a structurally complex tadpole with working organs. “In the course of one study, quite by accident, we observed two sets of eggs, one set starting about twice the size of the other. We watched the embryos develop side-by-side. Because of the initial size difference, we expected to see lots of structural deformities or at least for the tadpoles to come out twice as big. 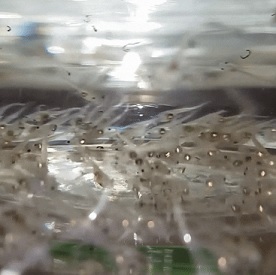 To our surprise many of the ‘big egg’ embryos survived and their tadpoles grew to the same size as the ‘little egg’ tadpoles, somehow managing to self-correct while they developed,” Dr. Davidson says. At a time when tissue engineering is becoming increasingly useful in regenerative medicine therapies, Dr. Davidson estimates there are only about five or six other groups in the world making material property measurements in the living tissue of vertebrates like frogs. Building on his research and combining it with results from a 2016 NIH-funded study “Mechanical Control of Mesenchymal-to-Epithelial Transition,” he will continue to flesh out the mechanics of growing tissue. Illustration: Xenopus tadpoles are excellent test subjects because their transparent bodies allow for unobstructed views into their internal anatomy. Credit: MechMorpho Lab/Lance Davidson.